We’re enjoying perfect Easter weather in Santa Rosa, and yesterday afternoon I visited Railroad Square, where the trees are blossoming. I took several photos, including this one of the former Petaluma & Santa Rosa Railroad depot (which is now Chevy’s restaurant). As you can see, the depot’s name is still visible (although usually unnoticed by passers-by) in the wrought ironwork of the balcony, which is above what was the main entrance of the Spanish-Colonial-style depot when it was built in 1927. Its survival is quite remarkable, given that passenger services on the P&SRRR ceased in 1932. The building’s appearance has recently been improved by new paintwork. The photo below shows the full façade of the building. On the other side of the blocked door is the restaurant’s bar. The reason that I didn’t choose that as my header picture was because, as you can see, it’s impossible to get a composition without its being spoiled by all the cars parked around it! This railroad depot achieved fame by being featured in the 1943 Alfred Hitchcock movie, Shadow of a Doubt. 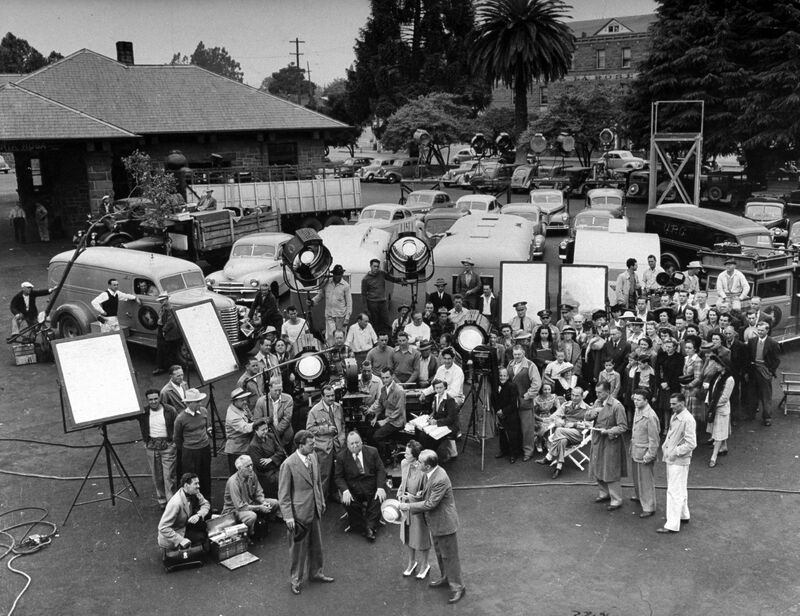 There’s a well-known photo of the entire cast and crew in front of the depot. Perhaps the building’s more impressive achievement, prior to that, was that, along with most of the other stone buildings in Railroad Square, it survived the 1906 earthquake, which did far more damage per capita in Santa Rosa than it did in San Francisco. It’s heartening to be able to report that passenger trains are once again stopping at this depot, for the first time since 1958. Yesterday, as I arrived at Railroad Square, a northbound train was paused at the station, as shown below. The Snoopy statue on the right in the photo above, which stands in front of the former Railroad Express Agency building (now a coffee/ice-cream shop), is painted as a SMART conductor, shown in close-up below. Immediately beyond the railroad depot stands the La Rose Hotel, which is visible in the photo below, behind the huge monkey puzzle tree. In my Easter-time post of last year, I mentioned that I’m very glad to be free of the macabre, ignorant religious nonsense that afflicted this time of year during my youth, in nominally-Christian Britain. Instead, I’m now able to enjoy the real significance of Easter, which is the seasonal regrowth of life in Northern climes. Of course, I’m aware that the festival occurs at this time of year because it originated in cultures of the Northern Hemisphere. In the Southern Hemisphere, it makes no sense at all, a simple fact that seems to have been completely unknown to the supposedly-omniscient gods! Planning Your Career: Aim Too High or Aim Too Low? The photo above—which could be titled “In the Bleak Midwinter”—shows the sun setting through freezing fog in University Valley, Coventry, in January 1979. The location was approximately here, although it’s now unrecognizable. At the time, I was feeling very bleak myself, because I really wasn’t sure why I’d embarked on an Engineering Science degree course at Warwick University, with a view to becoming, of all things, a Civil Engineer. As I’ve described in a previous post, that experience didn’t go well, but, in retrospect, it actually turned out to be for the best, since a short time later I moved to a more prestigious university and obtained a better degree, in a subject that was more appropriate for my skills and interests. It’s interesting to examine the flawed thought process that led me to make that discouraging “false start” at Warwick, and whether it would even have been possible for me to have made career decisions more wisely in those days. When I was growing up, I spent a lot of time worrying about what I was going to do with my life. As I grew older, I came to realize that I should be worrying more about what life was going to do to me! That may be all too true, but it does nothing to answer the question that occupies the time of many young people (including me, at that age), about what career to choose, and, in general, what path to take in life. What do You Want to be when You Grow Up? Are You Joking? It has become a cliché that most children are asked at some point what they’d like to be “when they grow up”, and I was no exception. My earliest recollections of my ideas on that topic suggest that I wanted to be a train driver. However, my mother claimed that the answer I gave to that question was that I wanted to follow in my grandfather’s footsteps, and be “retired”! In retrospect, it is now obvious that, had I tried to answer that question seriously, and had I somehow been able to give an accurate answer, nobody would have believed me. Well, I think I’ll aim to get a degree in Electronics from one of the world’s top universities, then that should enable me to get a job with the BBC, so I can become a video engineer. Once I’ve mastered that, I’ll move to California to work on advanced video system design. Maybe I should also invent a few new video systems and techniques, to earn me some patents in the USA and Japan. I can just imagine the kind of response that I’d have received to such a statement! There would have been much rolling of eyes, shaking of heads, and almost certainly some laughter or derision. I’d have been accused of not treating the question seriously. But the paragraph above describes exactly what I actually did do during the ensuing quarter-century! In retrospect, it’s obvious that, although my career choice at that age was an important decision, it was really much less important than I was led to believe at the time. In contrast to my indecisiveness, my best friend at school never seemed to have any doubts about what path in life he wanted to follow. He had created his own marionette act while at primary school, which he performed around the Scarborough area, and, when we were at school together, he was always certain that his future lay in show business. I was envious of his clarity of purpose and determination to achieve it. He went on to win ATV’s New Faces show, on national television, and dropped out of school to pursue his dream, eventually becoming one of Britain’s most successful theatrical agents and managers. I had to learn the hard way just how true is the following statement. If you don’t build your dream, someone will hire you to help build theirs. As a young man, I would certainly have found the idea of “building my own dream” impossibly daunting, but nonetheless, time expended trying to define “my dream” would have been well-spent. This kind of advice is sometimes taken to mean that you should start your own business, but that’s not necessarily the case. You may be able to work for someone else, and yet also gain skills that will lead you towards your dream role. One major problem that negatively impacted my career decisions was the insistence on over-specialization, at too early an age, that was a feature of the British educational system. The requirement to concentrate on a limited range of subjects at school, from the age of 13, effectively closed off many careers to me. I’ll have more to say about this problem in a future post, but I want to mention it here because it has probably had such a negative effect on the lives of many. I realize that people of my generation and younger can perhaps consider ourselves lucky that we even have the luxury of being able to choose our goals in life. For many people—perhaps the majority—throughout history, those options were simply not available, and their paths through life were largely restricted and predetermined at birth. For my parents, and many of their generation, their attempts to plan their lives were repeatedly interrupted by major events beyond their control, such as two World Wars in my father’s case. Even those who managed to avoid taking overt personal risks sometimes found themselves impacted by the misfortunes of others. My mother’s first husband died of tuberculosis (contracted in a Japanese POW camp), which then almost killed my mother (her life was saved only by the development of new “wonder drugs” at the end of the 1940s). By comparison with my parents’ battles, my own worries and concerns have always seemed trivial, but nonetheless I did have to make important decisions about my future at a young age. The best advice I can give to anyone trying to make a career decision now is as follows. In offering these tips, I’m well aware that it’s much easier to give this type of advice than it is to follow it! Don’t fret the details. Don’t waste time trying to predict or plan exactly what you will do. As I showed above, even if your predictions were to be 100% accurate, there’s a good chance that nobody, including you, will believe them! Some people try to plan in immense detail, and are then disappointed when things don’t work out exactly that way. Build Your Own Dream, by aiming to do what you enjoy doing. I realize that this is common “pop psychology” advice. It sounds trite and is usually much easier said than done! However, it has a valid basis. One way or another, you will spend a significant portion of your life doing whatever you choose to do as a career. Choosing to do something you don’t like is therefore a terrible form of self-punishment. You only get one go at life, so you will never get back all that time that you spent being miserable. Don’t worry too much about relative pay or current career prospects. These conditions tend to change with time, so the job situation when you actually enter a field is likely to have changed relative to when you made your career plans. Many jobs that existed when I was trying to make my career decisions simply no longer exist at all, and vice versa. There are also more subtle pressures. For example, I chose Electronic Engineering over Computer Science for my degree, partly because, at that time, I could obtain an apprenticeship in the former but not the latter. In retrospect, though, Computer Science would have been a better fit for my skills and interests. Always aim “too high”; that is, aim for the highest level that you can achieve. For example, if you can get a Ph.D., and if it’s relevant to what you want to do, be sure to do so. Don’t fear failure. Again, this is easier said than done! My parents seemed to have a fatalistic view that, if you tried something but failed at it, you were somehow marked for life as an “irrevocable failure”. In fact, many successful people have experienced some failures along the way, but still their achievements outweigh their failures. They don’t “write themselves off”, nor permanently wallow in self-pity, because of a failure. Treat career advice with caution. I recall many instances when someone said to me, “If I were you, I’d…”, then proceeded to offer some well-meant advice. The problem, in all cases, was that the person offering the advice was not me, and typically had completely different skills, aptitudes and interests from me. For example, an art teacher was never going to advise me to become an engineer, and a science teacher was never going to advise me to become an artist, but what I now do involves both skillsets, so I was right to insist on developing both. Reject advice from “No-Talent Naysayers”. Not all career advice is well-intentioned. Unfortunately, there are many in the world who have no particular talents, and who try to compensate for their own failings by belittling the abilities of others. Such people will invariably tell you that, whatever ambitions you have, you’re sure to fail. I grew up with the British class system, where the typical claim would be that, “People like us don’t achieve things like that”. The best response to such nonsense is not only to recognize it when you hear it, but also to feel sorry for the inadequacy of the person saying it.